There’s been a lot of hype surrounding the new Star Trek series, Discovery, that CBS is producing for its streaming service All Access, and we wanted to see how the premiere—which got a big promotional boost in the form of a linear broadcast on CBS Sunday night—captured audience attention. According to Inscape.tv, (the TV data company with glass-level information from 7 million smart TV screens and devices), the episode started off strong but by the midway point, the live viewing audience had dropped by nearly half. What could cause this type of live attrition? In a word: football. The NFL is back to dominate TV screens each Sunday. 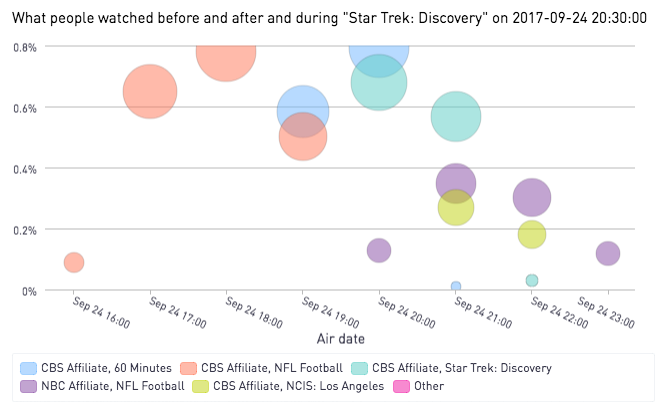 Audiences were not only likely to be watching football on CBS before Star Trek: Discovery, they appeared to be switching over to the football game on NBC more and more as the episode went on. What insights can be drawn from all this—other than the fact that Star Trek: Discovery viewers are also, curiously, football viewers? 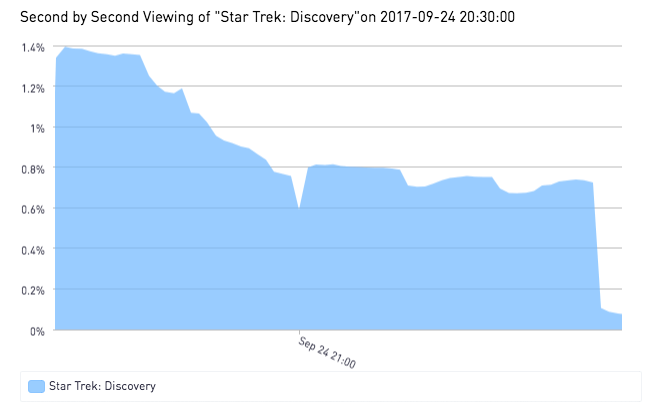 We’d caution against drawing any broad conclusions about Discovery’s prospects given the sporting competition—and also because a big part of the “sell” of this series is that it’s non-linear. In other words, anyone who tuned into the special linear presentation was made to understand that, via CBS All Access, they can watch it—or finish watching it, whatever the case may be—at any time online. Will viewers who sampled Star Trek: Discovery on CBS but then tuned out in favor in football return to watch it online and become loyal viewers? Stay tuned (or streamed).